Next time you need a gift for a loved one overseas, DON'T sigh and relegate yourself to a souvenir store. Simply click over to the very talented print designers at Laughing Bird and snap up a gorgeous contemporary Australiana tea towel, apron, lavendar bag or t-shirt and gift card. 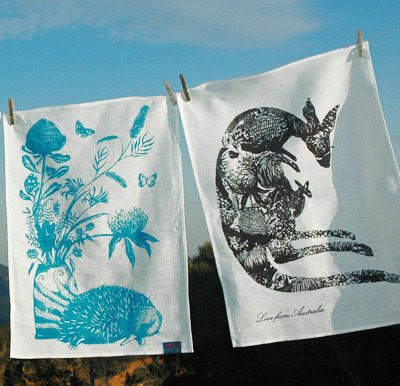 I particularly love the linen tea towels that I think are stand-alone art pieces, featuring native Australian flora and fauna (no doubt inspired by the studio's beautiful location in the Blue Mountains, NSW). Have a close look at the kangaroo and joey - made entirely out of wildflowers. And a lot more stylish than a stuffed koala! You can find Laughing Bird products in the online store and at stockists online and around Australia. Hi The Cottage Cheese and Blinky St. James. I adore these too. Contemporary but definitely with a nod to old-school souvenir tea towel illustration too. Tasteful Australiana! 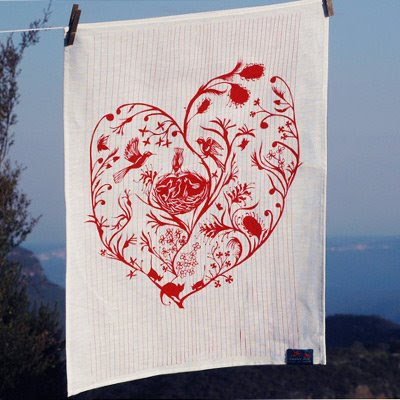 I love these tea-towel designs. Hi Natalie - so cool huh! (although I don't think it will be long before the old daggy Australiana stuff is suddenly hip again). Hi Wini - go to bed already! I'm glad you like them too. Something a bit different and definitely something I think that a loved one would cherish. Have a great rest of the long weekend.